The festive season is almost upon us and the Comoodle team have had a busy year working with all our fabulous sharing community. We’ve learned so much in 2017 about how to make a sharing project work, and now we’re ready to take it to the next level. We’re designing a new, improved version of the Comoodle website and we’d like you to get involved. There will be tipis... and hot chocolate! You might have noticed the Hygge Tipis that are currently set up outside Huddersfield railway station as part of the Winter Festival. 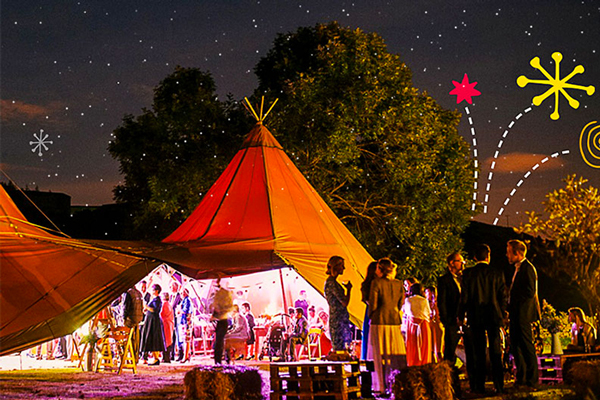 In December Comoodle will be setting up our Research HQ in one of these tipis for a couple of days and sharing the space they have created. We’re inviting our Comoodlers to join us for hot chocolate and a chat. There are three separate events you can get involved with – all of them will help us to find out your views on how the project is going, and what you think should happen next. We want Comoodle to work for our community so we’re really keen to draw on your experience: you are the community and you know what’s needed. If you’d like to get hands on with the very latest designs for our online platform, you can book a free session with our developers Yoomee to test the new layout of the website and have a play! These sessions are aimed at people who are new to Comoodle but existing users are welcome too. Sessions will be held on the 6th and 13th of December and can be booked here. If you’re one of our frequent Comoodle traders then your experiences of the sharing process are really valuable to us – you can help us improve our processes and make more assets available in the community. To book a fact-finding session with our Project Officer Gemma on the 6th and 13th of December click here. Alternatively if you’d just like to meet the team you can drop in and see us on Wednesday 6th December between 1130 and 1630 or on Wednesday 13th December between 1430 and 1830. Drop-in visits are informal and a great chance to discuss how we can create or enhance your Comoodle account, and discuss how we can improve the programme too. Everyone who turns up will be offered a hot drink and a place at our open fire! There are lots of ways to find out about Comoodle and get involved in our sharing community. Visit our blog site at www.comoodle.com or check us out on Twitter, Facebook and LinkedIn, or see our latest videos on our Youtube channel.